The front, rear, insides overview, drive cage and BC4030 processor card from my Cubix. 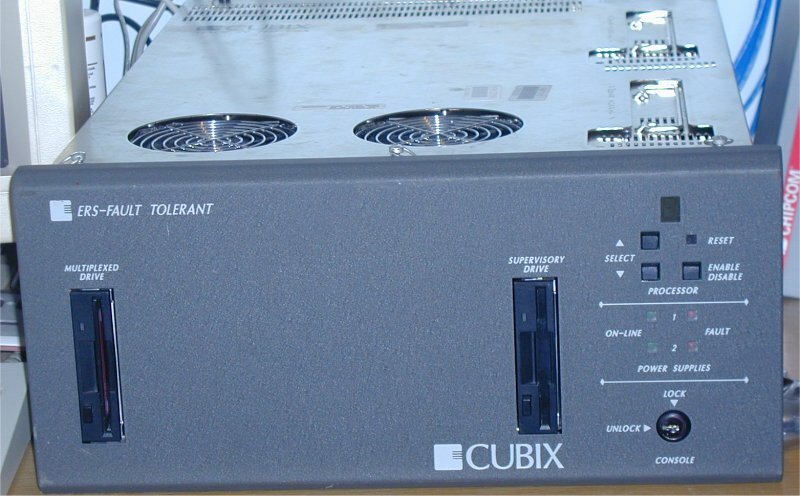 Cubix produces multi-bladed computers designed primarily for fault tolerance. This means that they have multiple single-board-computer cards (a PC on a single card) which operate independantly of each other with the aim that should anything happen to one card, another can take over its work. 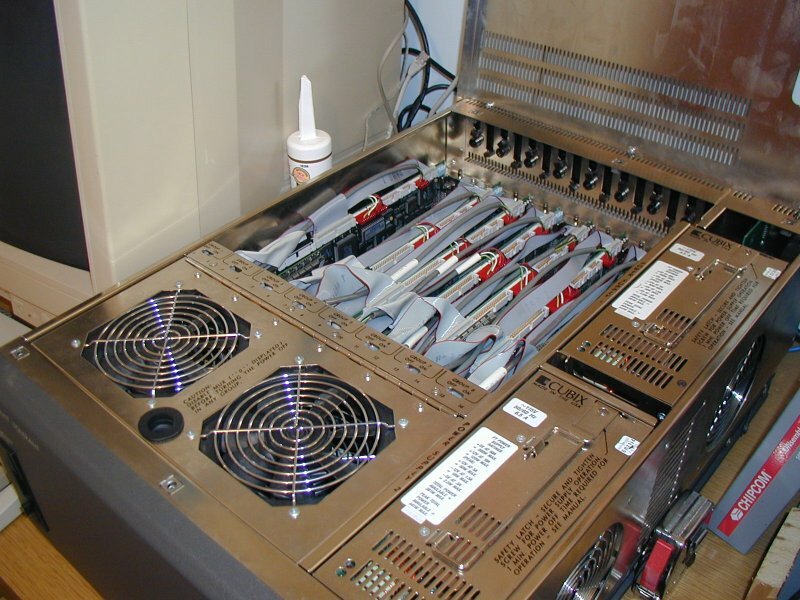 The ERS-FT is one of the oldest Cubix units, with a passive 16-slot ISA backplane allowing for up to eight processor cards, splitting up the backplane into 8 2-slot busses. The ERS I have comes built-in with a Supervisory Card (IES) which runs on a single 386 chip. 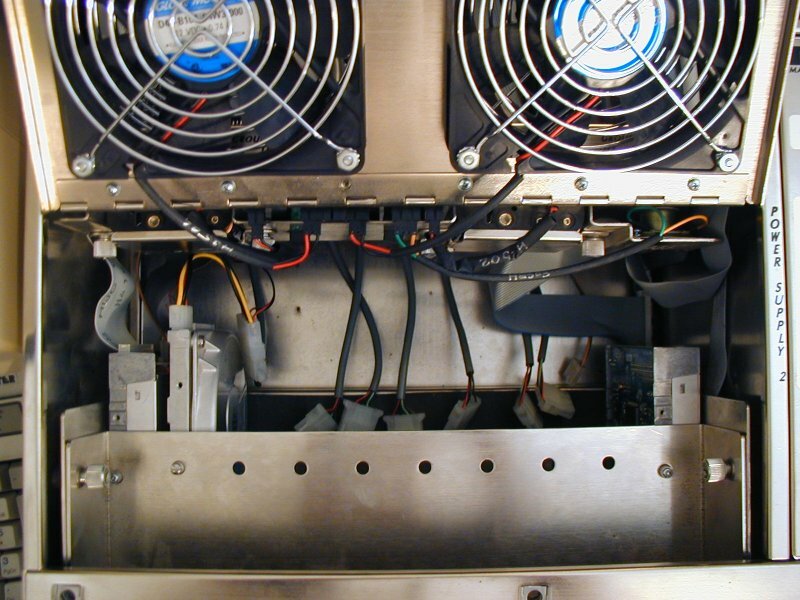 It's designed to watch over the other processor cards, and shut them down/power them up when necessary. I pulled this because I don't really need it. This ERS-FT has 7 BC4030 processor cards, originally coming with either a 486-33mHz or a 486 DX-40mHz. My Card#0 actually has a 140mHz overclocked AMD 5x86 sitting on a riser to allow it to run off the 5V 486 socket. Each processor card can handle up to 64MB in 72-pin true parity RAM, kind of difficult to find these days. 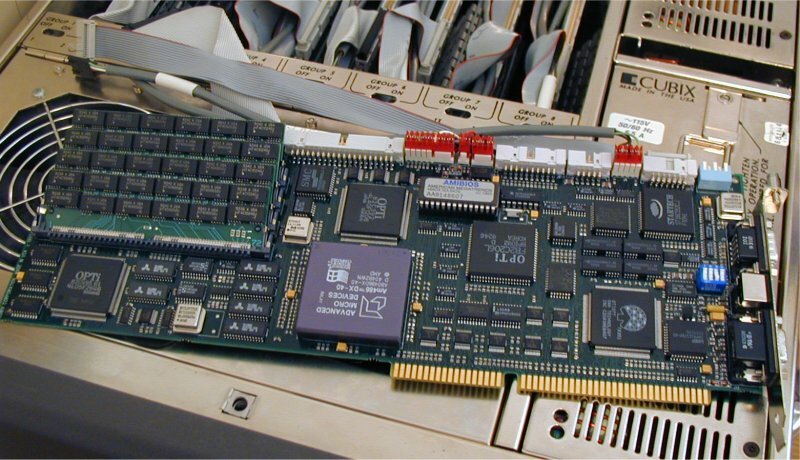 There are many different processor card configurations, the BC4030 have a single IDE bus, onboard Oak video chip, and a VGA/ PS/2 keybard/ DB9 serial out on the back. A neat trick that Cubix took care of was multiplexing all the cards onto a single monitor and keyboard, and even the single floppy-drive. On the front of the chassis is a digit-counter and some 'Up'/'Down' buttons. You plug an external propreitary KVM unit into a DB25 port on the rear (I have pinouts, if anyone wants to make their own like I did), and then your monitor/keyboard into that. You then use the Up/Down buttons to switch between which processor blade is hooked up to the monitor. This also works for the FDD, which will only talk to a blade when it is selected in the KVM. All other blades trying to talk to the FDD will get a 'Not Ready' signal instead. Nifty, don't you think?